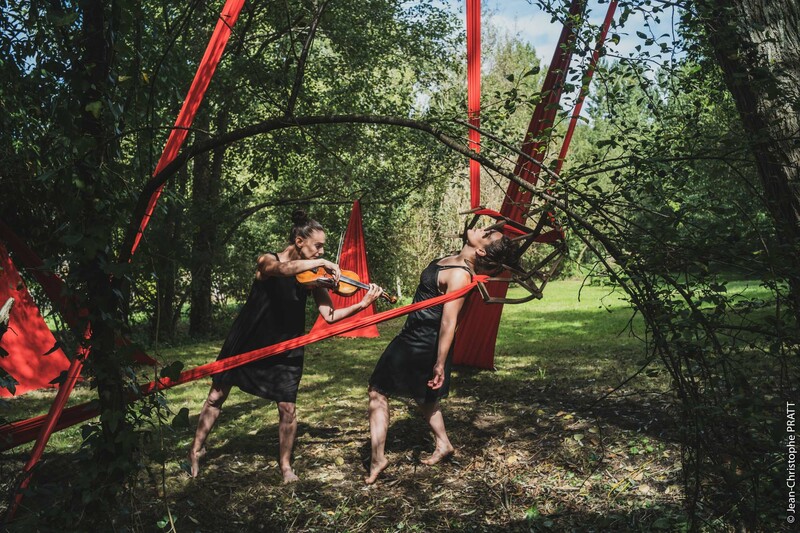 STRETCH /HOOK is a powerful and provocative live performance integrating sculptural installation, dance, and live music. John Cira’s installation, consisting of mammoth rays of illuminated spandex growing out of the ground and surrounding architecture, slices across the space, creating an immersive landscape for dancer / choreographer DeAnna Pellecchia to discover and traverse. The kinetic facades alternate from obstacle to vehicle; friend to foe as she climbs, dives, swings, disappears into, and emerges from the towering walls of fabric. The accompanying musician (either violinist Emily Stewart or jazz pianist Kenny Werner) plays a spontaneous composition, acting as a fluid partner for the athletic choreography. The three elements intertwine and drive each other, culminating in a literal unraveling and exciting transformation of the installation itself. Each of Cira’s installations is specific to the space it occupies; Pellecchia’s choreography is designed in response to the installation and performed improvisationally in real time conversation with the musical composition. Every performance of STRETCH / HOOK is distinctly different — with each rendering, each space, each musician, the piece changes, offering a unique and exciting experience for both performers and audience. STRETCH / HOOK features original lighting design by Lynda Rieman and couture costuming by fashion designer Carlos Villamil. This project is ready for touring; can be installed / performed in galleries, museums, and outdoors spaces; and can feature a rotating cast of musicians.